So I decided to leave the crusty bread loaves to the experts. I would stick to cookies and brownies in my bakery. 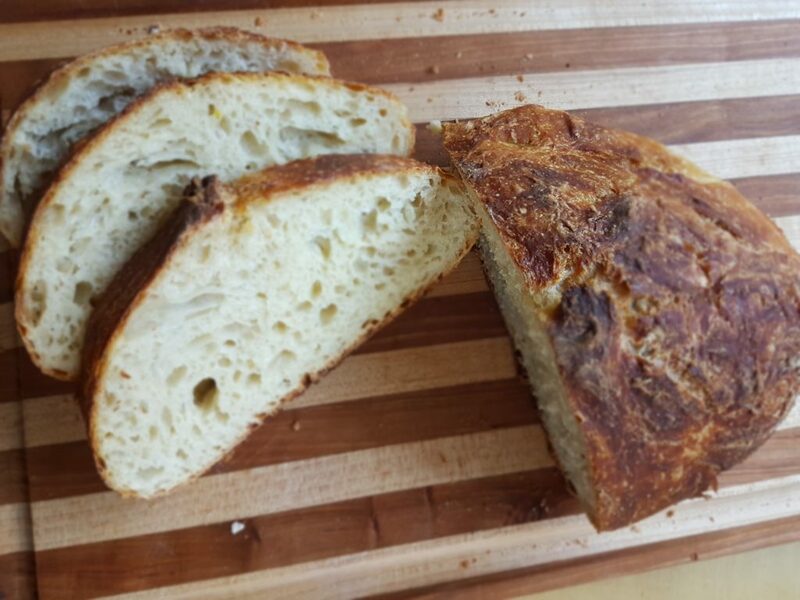 Then my friend Sandley shared an exciting find on her blog: Jim Lahey’s no-knead dough. As convincing as her bread story was, it was the photos that did me in. 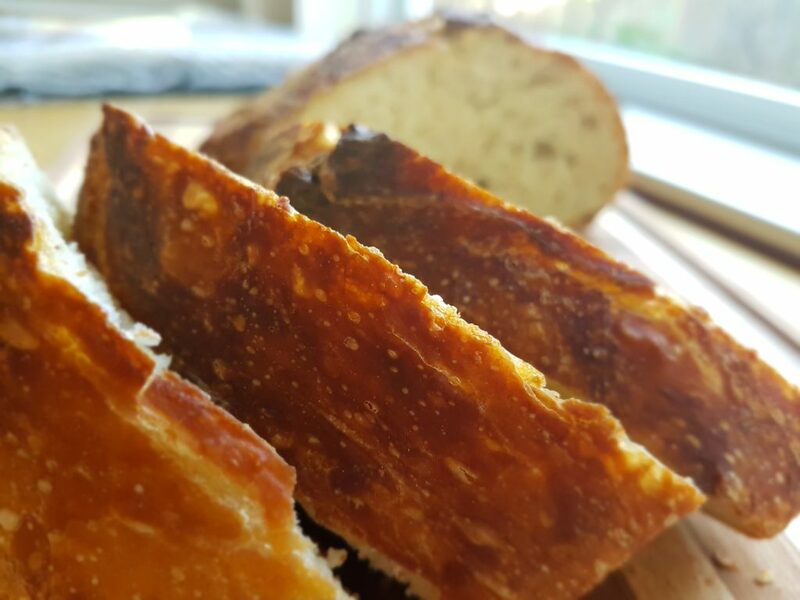 That, and this line: This bread has a wonderful crusty exterior, soft air-punctuated interior, and looks amazing. Last year, she moved away (sniffles!) and left me with the rest of her instant yeast. There was a lot, so I decided to give the recipe a go, and I haven’t looked back since. Actually, I have looked back a lot. I have looked back at her blog and the recipe many times and decided it’s time to get this well-loved recipe onto MY blog for ease of use (and to share with all of you!). It is now a staple at our dinner table and is perfect for sopping up sauces or enjoying alongside a carby pasta dinner. It only required 4 basic ingredients: Flour, salt, yeast, and water. The only special equipment required is a dutch oven (though I guess this is a con if you don’t have one. Or an excuse to buy one? 😉 I have used this Lodge 7.5 qt for years and love it!). You can start it at night before going to bed and bake it the next evening for dinner. You don’t need a mixer or dough hooks, or wrists of steel for kneading. 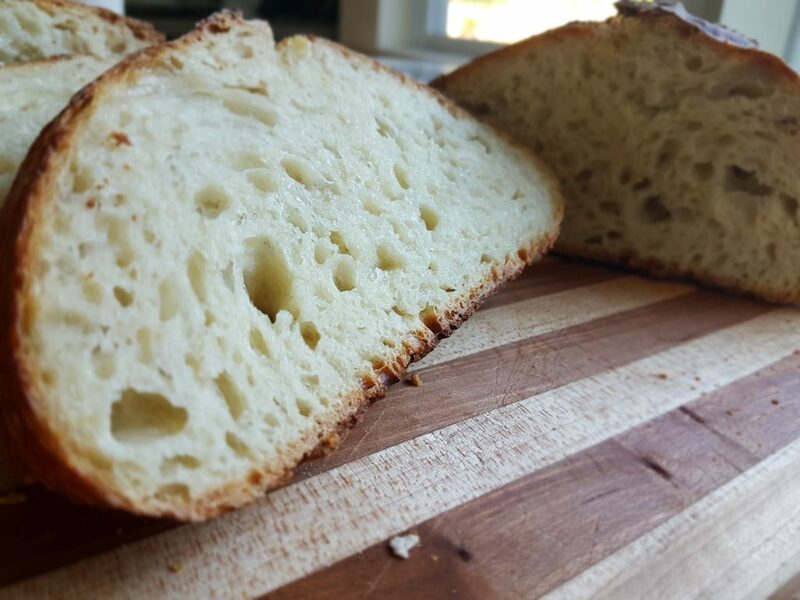 It’s a no-knead recipe! The kids love it. One loves the crusty outer parts, the other loves the soft and chewy insides. Ben and I love both- tasty, full of great texture, and delicious! Without further ado, the recipe. Check out her blog for more detailed photos and instructions if it’s your first go at it! Whisk together the dry ingredients in a ceramic or glass bowl. Metal bowls are okay, but the dough may not rise as well. Add in the water and mix with a dough whisk or spatula. Don’t overmix. It doesn’t have to be pretty. Cover the dough with plastic wrap and let it rest for 12-20 hours (preferably about 18 hours). Gently scoop the dough out of the bowl onto a floured surface. Give it a quick roll in the flour, set it on parchment paper, then cover the dough with a cotton towel and let it rest for 30 minutes. Meanwhile, put the dutch oven and lid into the cold oven and then preheat the oven (with the dutch oven in it) to 450 degrees for 30 minutes. Add the dough into the dutch oven and let it bake for 30 minutes with the lid on. I just pick up the parchment paper with the dough on top and drop it all in. Remove the lid and let the dough bake for an additional 15 minutes, until golden brown. 10:30pm – Do steps 1-3. Let sit overnight on counter. Mixing dough anytime between 8:30pm-4:30am should be okay as that is within the 12-20 hour window. 4:30p – Gently scoop the dough out of the bowl onto a floured surface. Give it a quick roll in the flour, set it on parchment paper, then cover the dough with a cotton towel and let it rest for 30 minutes. Preheat the oven (and dutch oven and lid) to 450 degrees for 30 minutes. 5:00p – Add the dough into the dutch oven and let it bake for 30 minutes with the lid on. 5:30p – Remove the lid and let the dough bake for an additional 15 minutes, until golden brown. 5:45p – Cool on a rack. I love your timeline. That’s how I work. I will try your recipe tonight. Glad it makes sense to you! Hope it was delicious! haha do you still have a lot? I’ll take some! Yep! When you only use half a teaspoon per loaf, Sandley’s jar lasts a longgg time. I already gave half of it to Wendy and I still have a lot left! I do have a dutch oven and I think I’ll be using it a lot from now on. I started the bread last night and baked it this afternoon for lunch. Oh my! The family loved it! I’m already thinking about starting another loaf for tomorrow!! Thank you for an incredible recipe!! DELICIOUS!! Woohoo! I am so proud of you! I’m so glad everybody loved it 😀 Yay this makes me so happy! I’m so excited to try this recipe in my new dutch oven!! Yeah! Lmk if you want some saf instant yeast!